A Versatile Wordpress Theme Designed For Internet And Social Marketers! A Versatile Wordpress Theme Designed For Internet And Social Marketers! 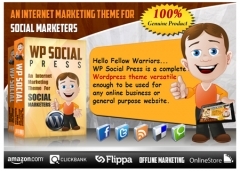 WP Social Press is a complete Wordpress Theme versatile enough to be used for any online business or general purpose website!